In last week's mail, I received an invitation to the Foreign and Commonwealth Office, in London, for the book launch of the Dictionary of Falklands Biography. Unfortunately, I won't be able to make the trip, but the project should appeal to anyone interested in the South Atlantic Ocean, Patagonia, and the Falklands (known to Argentines as the Malvinas) in particular. Most of the contributors to the book's short bios are British, but there is one prominent Argentine historian and one Chilean. Some entries are autobiographical. Lack of time and money prohibit my attending the launch, but the book deserves attention. Covering the period prior to the Argentine invasion of 1982, it's been a labor of love for former Islands Governor David Tatham, who invited me to contribute a piece on Scottish sheepfarmer John Hamilton (pictured here), who emigrated to the islands in the 1880s but spent much of his life in Chile and Argentina as well. In the mid-1980s, I had spent a year-plus in the islands on a Fulbright-Hays grant while researching my PhD dissertation in geography at the University of California, Berkeley; during that period, I did some biographical research and writing on Hamilton with materials from the local archive. While I also did some university teaching in the ensuing years, I got sidetracked into guidebook writing (which. however, has allowed me to revisit the Islands several times) and thus never published that material until now. Hamilton is an interesting figure because he embodies the ambivalence and ambiguity of the relations between the Islands and the continent. He acquired substantial properties in Argentine Patagonia and, in 1904, he married Olivia Heap, a Scotswoman who had been a nurse at the British Hospital in Buenos Aires. His daughter Penelope later married an Argentine. Even as his Argentine properties prospered, Hamilton kept a close watch on the Falklands and, when opportunities arose, he began to acquire property there. In 1922, for instance, he bought Beaver Island and adjacent islets; shortly thereafter he purchased Weddell Island and the Passage Islands, and then Saunders Island (pictured here) in the mid-1930s. He also owned property in Stanley. While he lived mostly in Argentina, Hamilton was neither a speculator, nor a stereotypical absentee landlord. He took positive action to improve pastures on badly overgrazed Weddell, including stock reductions and replanting of tussac grass, and he imported coniferous trees from Punta Arenas as ornamentals and windbreaks. He also attempted to diversify the farm economy through minor industries such as seal oiling (soon abandoned) and the introduction of exotic mammals such as foxes, skunks and guanacos from the South American continent. The idea was that their pelts, as well as those of South American otters, would find overseas markets; ironically, foxes proved a plague to West Falkland farmers. Hamilton kept much of his money locally, with more than £90,000 in Stanley's Government Savings Bank even during the 1930s Great Depression (when he donated several thousand pounds for construction of lighthouses on East and West Falkland, and improvements to King Edward Memorial Hospital). He also researched road-building in the countryside at a time when such projects were so visionary as to be almost hallucinatory. In 1940 Hamilton moved to Buenos Aires because of a chronic eye problem and, when ongoing treatment required him to remain nearby, he purchased a stud farm at the locality of Merlo, west of the Argentine capital. He died in September 1945, survived by his daughter Penelope Alvarez. Unfortunately, the Falklands properties became a bone of contention because of their ownership by Hamilton's Argentine heirs; while Hamilton had once attemped to move his headquarters from London to Stanley, he ran into complications with Argentina, which may have seen his properties as a foothold in the Falklands. Instead, he incorporated offshore in Jersey. After his death, many Islanders argued for Hamilton's expropriation as part of an ambitious land reform scheme that never came to fruition. In 1987, five years after the South Atlantic War, the Hamilton estate finally sold Beaver, Weddell, Saunders and surrounding islets to local residents. In a visit to Weddell only a few months before that took place, I copied the photograph above; a few years later, Hamilton's handsome Weddell house, with its spectacular interior woodwork, burned to the ground in a chimney fire - the photograph with it. In late 1978, only a couple months before I first traveled to Chile and Argentina, the two countries nearly went to war over the possession of three small islands in the Beagle Channel, east of Isla Navarino, in Chilean Tierra del Fuego (directly opposite the Isla Grande de Tierra del Fuego, which is divided between the two). At the time, both countries were under notorious military dictatorships, and only a handful of foreign visitors came to enjoy one of the planet's most stunning combinations of sea, sky, land and ice (Navarino is the island in the background of this photograph, which was taken from the mountains behind the Argentine city of Ushuaia). Fortunately - it was a close call - the two countries agreed to a papal mediation that averted war, but that did not mean all was well. When I first saw Ushuaia in April 1979, shop windows were full of posters with the uncompromising slogan ¡Nunca Cederemos lo Nuestro! ("We Will Never Give Up What is Ours!"). Later that month, as I hitchhiked from Bariloche back to Chile, the Argentines had not yet dismantled gun emplacements on what is the second most important border crossing between the two countries (no military preparations of any sort were apparent on the Chilean side). It's a tangible measure of progress, in what is now one of the world's most peaceful regions, that the Chilean Senate has invited Pope Benedict XVI to celebrate the successful mediation later this year. According to Senator Carlos Bianchi of Punta Arenas, "The idea is to get Argentine and Chilean members of Parliament together both in Patagonia and Antarctica to commemorate thirty years of peace.” Near the Santa Cruz province town of El Chaltén, at Lago del Desierto, where a Chilean policemen died in a firefight with Argentine gendarmes (border guards) in 1965, the Argentines have erected a respectful memorial to their former enemy. Perhaps the delegations can meet in the hamlet of Puerto Williams, on scenic Navarino, where the Chilean navy still maintains a base - though it's much smaller than the Argentine base in Ushuaia. For any on-board ceremony, though, they'll have to requisition a bigger vessel than the one I found anchored on my last visit there. Despite a reputation for military bellicosity, South America's defense spending is world's smallest, as a percentage of GDP. This week, for the first time, the International Whaling Commission is meeting in Santiago. Yesterday at Quintay, a former whaling station south of Valparaíso, Chilean President Michelle Bachelet took advantage of the occasion to declare all 43 cetacean species in Chilean waters to be national monuments. In Chile, a national monument is usually an archaeological or architectural landmark, and it may also be a protected area comparable to a national park (though usually much smaller). The designation can also apply, however, to "regions, objects, or living species of plants or animals of aesthetic, historic, or scientific interest, to which is given absolute protection." There is plenty of precedent for Bachelet's action, which in effect creates a coastal reserve of 3.3 million square miles within Chile's 200-mile Exclusive Economic Zone; other species enjoying such protection include the alerce (falsh larch) tree, the Andean condor, and the Andean huemul (a endemic deer that appears on Chile's coat-of-arms). Marine mammals such as Commerson's dolphin (pictured here) will join them on the list. In Argentina, the southern right whale that breeds at Península Valdés enjoys similar status under the national park service, but this measure is less far-reaching that the new Chilean measure (which drew immediate objections from Japan, which does whaling for "scientific research" in the southern oceans and Antarctica). Over the last several years, Buenos Aires has made frequent appearances in the travel sections of daily newspapers and in travel magazines of various orientations. Now, though, it's starting to crack the mass media in other categories, as happened last week when, fortuitously, we saw our own Palermo apartment on HGTV's House Hunters International. That's a little misleading, as I'll try to explain. In the program in question, a couple from Punta del Este (Uruguay) were relocating to Buenos Aires for professional reasons, and needed to find housing for themselves and their two Labrador retrievers. It meant downsizing, especially for the dogs, and one of the apartments they visited was a spacious flat in a new building just two doors away from our rather more modest unit (whose exterior was visible in some of the street shots). The view of the café across the street (pictured above) is virtually identical to ours but, in a city where people often leave their dogs on balconies during the day, this apartment's semi-circular balcony was not large enough for two 80-pound Labs (one of our neighbors has a rather shy and quiet Rottweiler who spends much of the day on theirs). Eventually, the couple settled for a smaller but luminous Recoleta apartment with a larger balcony. Buenos Aires's idiosyncrasies, as seen by a foreign resident, also come out in an insightful article by novelist Maxine Swann in last week's New York Times Home & Garden section. Swann points out, for instance, that "Mentioning you have an appointment with an analyst, or that your child does, is comparable to saying you have a hair appointment," even though "the Argentines I was meeting did not seem particularly interested in self-improvement." That may be the case, of course, unless you consider "Tango Therapy" as a means of self-improvement (a few years back, during the 2002 economic meltdown, one dance instructor offered "Self-Help Tango" during the annual Festival de Tango). Swann points out some of the pitfalls that anyone living in the city may encounter, such as improvised repairs in her Chacarita rental that led one plumber to say "What the hell is this?" Her landlord, meanwhile, built a rooftop pool that once flooded her apartment, and she missed the opportunity to buy an apartment after the meltdown, though she and her Argentine then husband managed to rent a spacious Recoleta flat at bargain prices. Nothing that Swann writes will really surprise anyone who's lived here, rather than just visiting as a tourist, but she does a good job of summarizing the rewards, as well as the drawbacks, of this fascinating city. 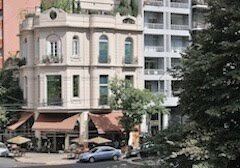 It's essential reading for anyone considering a leap into the Baires real estate market. For what it's worth, she says her next novel will be set in Buenos Aires. Chuck Goolsbee of Washington state won a copy of Moon Handbooks Chile by correctly matching the landscapes in yesterday's entry. Chuck was the third respondent but the first to get them all correct; for those of you who didn't open the comments, the first photograph is the Chilean beach resort of Zapallar, north of Viña del Mar; the second is the Big Sur coast south of Monterey, California; and the third is the Veramonte winery, in the Casablanca valley northwest of Santiago, on the way to Viña and Valparaíso. Chuck, though, needs to get hold of me to claim his prize - Chuck, please send me a postal address at my email in the header above so I can send you the book. Given the initial response, I may do a quiz of of this sort a couple times a month with my various titles on Chile, Argentina, Buenos Aires, and Patagonia. I personally didn't think it was too difficult, but then I knew precisely where the photos were taken. I've mentioned it before, but it's worth restating how much Chile and California have in common. It starts with their physical geography, where both have long Pacific coastlines, low coastal mountains, fertile central valleys, and high interior mountain ranges. In both, summer-drought Mediterranean climates with heavy coastal fog are balanced by wet winters. In the early 19th century, though, Chile was miles ahead of California in its political and economic development, and had many northern European immigrants - at one point, the port of Valparaíso had two English-language newspapers. California, by contrast, was a thinly populated backwater until declaration of a "Bear Flag Republic," the Mexican-American War of 1846-48, and the discovery of gold eventually led to its absorption by the United States. Valparaíso, of course, was the first port of call for ships rounding the Horn en route to San Francisco, and Chilean residents soon found their way north during the Gold Rush. Among them were merchant Faxon Atherton (his namesake suburb is one of the Bay Area's wealthiest communities); James Lick (a piano builder and landowner who donated an observatory on Mt Hamilton, near San Jose, to the state of California); and Irish engineer Jasper O'Farrell, who arrived under Mexican rule, but remained to be San Francisco's surveyor. Most of these men were married to Chileans. During the Gold Rush, though, Chilean miners were a notable presence, commemorated through place names such as Chileno Creek (Marin County) and Chili Bar (Placer County). At the foot of San Francisco's Telegraph Hill, near Francis Ford Coppola's Zoetrope Studios (916 Kearney Street), an historical plaque commemorates the neighborhood known as "Little Chile." Not all of them were anonymous, as Vicente Pérez Rosales (for whom a Chilean national park is named) wrote of his Gold Rush experiences in Recuerdos del Pasado (a new edition recently appeared in English as Times Gone By). Given these geographical parallels and historical links, it's unsurprising that Chilean President Michelle Bachelet would give an address at the University of California, Berkeley, last Thursday. The University of California and the Universidad de Chile have long provided reciprocal assistance to academics conducting research far from home, and the Chile-California Chamber of Commerce encourages business contacts. In the aftermath of Chile's 1973 military coup, many political exiles found refuge in the state, among them novelist Isabel Allende. Allende, who now lives in Marin County, linked Valparaíso and San Francisco in Daughter of Fortune (1999). Many Chilean winemakers have come to work and study in California, and some producers have vineyards and wineries in both places. Before an adoring audience, which gave her a standing ovation after a question-and-answer period, Bachelet spoke in generalities about globalization and Chile's economic fortunes, reduced poverty rates since the return to constitutional government, education (including sponsoring talented Chileans here for post-graduate work), and the need for multilateralism in addressing issues such as global warming (which came across as soft-spoken criticism of the current U.S. administration). Most questions had to do with Chile's energy crisis and the issue of renewables - part of the reason her stop included a visit to the Lawrence Berkeley Laboratory - but none of them dealt with the controversial issue of damming Patagonian rivers. All the questions were written and thus subject to screening; because of time limits, only a few could be answered. My own time limits prohibit any further analysis here, but video for the hour-long event is available through the website of Berkeley's Center for Latin American Studies. Bachelet has a good command of English (not so fluent as Arnold Schwarzenegger, but better than George W. Bush). For those who have made it this far, a simple contest: the first respondent who can tell me which of the photographs in this post come(s) from California, and which from Chile, gets a free copy of my guidebook Moon Handbooks Chile. Last year, in an extensive survey, National Geographic Traveler rated the Falkland Islands among the best preserved of 111 island destinations, "retaining sense of place, with a few surmountable problems." The islands are, according to one of NGT's anonymous reviewers, "Quiet, delightful, and authentic. The market is limited because of cost and difficult physical access. For these reasons, there is every chance for the destination to be sustainable and to maintain its attractiveness." This month, the magazine has followed up with an article (not yet posted on its website) by Rolf Potts, who interviewed me a couple years ago about Patagonia in general and the Falklands in particular. Having finally made it to the South Atlantic, Rolf chronicles an archipelago where, unlike the better-known (and more diverse) Galápagos, land-based visitors can get up close and personal views of penguins, albatrosses, and marine mammals (he mentions the Commerson's and Peale's dolphins but not, surprisingly, the elephant seals that are so common on Carcass Island, one of the sites he visited). The most remarkable thing, of course, is that he encounters few visitors except at Volunteer Point, which has the Islands' largest concentrations of king penguins and is easily accessible from Stanley, the capital. I hadn't seen the latest statistics, but according to Rolf some 63,000 cruise ship passengers, most of whom take only day trips (such as Volunteer Point) en route to Antarctica or on 'Round-the-Horn cruises between Buenos Aires and Santiago, visited the islands this last season. The number of land-based passengers, by contrast, was only about 700 - ensuring an intimate experience with the islands' abundant fauna. In related news, a consultant to the Falkland Islands Tourist Board remarked on "the small scale of the Falklands tourism infrastructure." Land visitors, of course, may well see this as an advantage, and it means getting to know the people, as well as the landscape and wildlife, better. Yesterday, the Mercer Consulting group released its annual survey of the world's best places to live, which it rates according to standards of air quality, traffic congestion, personal safety, and the like. The results are used to "help governments and major companies to compensate employees on international assignments," so the results are clearly skewed to that demographic, but it still makes for interesting comparisons among 215 world cities. Business Week has provided an online summary of the results, in which Zürich comes in first, the highest rated US city is Honolulu (28th), and the worst is Baghdad (215th). To learn anything about Southern Cone cities, I had to go to Mercer's Argentine affiliate website, which shows San Juan, Puerto Rico, as Latin America's most highly rated city (72nd). Montevideo comes in 76th, Buenos Aires 78th, and Santiago de Chile 88th (primarily because of the public transportation chaos associated with the Transantiago bus system). As a three-day holiday weekend approaches, though, Buenos Aires has its own long-distance transportation problems: because of roadblocks associated with a longstanding farmers' strike that shows no signs of resolution, and bottlenecks in the fuel supply due to those roadblocks and to refinery problems (although fuel prices are rising, it's not been enough to balance supply and demand). Consequently, according to the Buenos Aires daily Clarín, long-distance bus services in the country have been reduced by 60 percent, and truckers' sympathy with the farmers has also caused urban food shortages. For international visitors, this is low season and the impact is minimal as yet, but if the ongoing tax dispute between farmers and the government continues much longer, it could affect the southern summer peak season. In a country where bus service is comfortable and affordable, this could put further pressure on a transportation sector whose air services are already overburdened. Spheniscus magellanicus is not the South Atlantic's most abundant penguin species, but it is easily the most visible, thanks to the accessible breeding colonies along Argentina's Patagonian coastline. Commonly known as the Magellanic penguin (but also as the jackass for its braying call), it spends the southern summer at sites such as Península Valdés, Punta Tombo (pictured here), and Cabo Vírgenes. There are also large accessible colonies in southern Chile at Isla Magdalena and Otway Sound, and on the Falkland Islands. Yet the Magellanic is, according to the IUCN, a threatened species. Since private cars and buses (on the mainland) and boats (in the case of Isla Magdalena and the Falklands) bring so many tourists to these breeding sites, it's tempting to agree with Dan Neil, who wrote in last Sunday's Los Angeles Times that conscientious travelers should avoid such destinations to protect the resource. Yet the consensus is that the major threat to Magellanic populations is chronic oil pollution, another instance of which occurred due to a collision between Greek and Maltese freighters off the Uruguayan coast over the weekend. Numerous penguins, which spend the winter at sea, washed up dead on nearby beaches. Despite Neil's contentions, it's hard to argue that well-regulated visits to Magellanic penguin colonies have any sort of negative effect on the birds - in fact, studies at Punta Tombo have indicated that reproductive success is comparable among birds exposed to human visits and those in more isolated areas. In all likelihood, visitors to Punta Tombo and elsewhere are likelier to appreciate the conservation issues involved - penguin-watching is a learning experience. In another instance, Neil is even farther off-base when he mentions Chile's Río Futaleufú (pictured below), a world-class whitewater river threatened by hydroelectric development - can he seriously think that, if rafters and kayakers refrain from descending the Fu, that no dams would be built? An explanation of this post's title: in the 19th century, South Atlantic penguins were often killed and boiled for oil, to be exported to Europe. While the birds did not suffer the depredations that whales and seals did, it's ironic that today they're being sacrificed in a different sort of "oiling" - which never could have happened in the days of sail. Is Chile the New New Zealand? Every Sunday, the Santiago daily El Mercurio dedicates an entire magazine to travel and, because the peso is so strong, more and more Chileans are traveling overseas. In last week's edition, Sebastián Montalva decided to compare Chile and New Zealand as tourist destinations with some interesting insights, but he was also guilty of some oversights. A caveat for this entry: I've spent years either living or traveling in Chile, and have never been to New Zealand except for a stopover en route from California to Australia, so I obviously know Chile much better, and know New Zealand primarily through reading about it. That said, the geographical similarities are palpable; both occupy comparable Southern Hemisphere latitudes, though New Zealand does not extend into the northern subtropics and tropics, where Chile has extensive deserts. NZ's North Island resembles the Chilean heartland, with its Mediterranean vineyards, while the South Island is an area of lush forests, mountains, and fjords that's similar to Chile's lakes district and northern Patagonia. Montalva says, in fact, that "Lord of the Rings" could just as easily have been filmed in the landscapes of Chile. So might have "The Last Samurai," also filmed in New Zealand, though given the local hysteria over the filming of the latest James Bond film in the Atacama, using Chile as a stand-in for Japan might have been dicey. Montalva notes that, despite similar resources, tourism brings New Zealand five times the income that it does to Chile, and wonders why. He says that the numbers of visitors are roughly comparable, but he fails to note that New Zealand's insular isolation means that almost all foreign visitors must travel great distances. Many of Chile's visitors. by contrast, come from neighboring Argentina and other South American countries, and spend less than affluent international travelers who fly into New Zealand. He does point out differences in language - other things being equal, tourists may prefer destinations where they can communicate with the locals (even if, in many cases, it's only with waiters and desk clerks). Compared to Chile, he says, New Zealand is also tidier and better organized. His main point, though, is that New Zealand does a better job of promoting its natural environment through activities such as whale-watching, which is barely in its nascent stages in Chile, even when Chile's resources may be superior. Pictured above, Chilean Patagonia's almost uninhabited fjords, for instance, are demonstrably wilder and more remote than New Zealand's Milford Sound, but there's been little relatively investment (financial or otherwise) in exploiting them. With his praise of New Zealand's environmental record, Montalva implies - but never explicitly criticizes - the potential shortcomings of Chile's own commitments. It's worth noting that New Zealand lacks a massive mining industry - Chile's biggest foreign exchange earner, which is counting on the massive development of Chilean Patagonia's abundant but remote hydroelectric resources such as the Río Baker (pictured to the right) for its future energy needs. If that happens, it could preclude Chile's ever establishing a sustainable tourist economy to match New Zealand's. At first, this entry might sound awkward, but I can't let the week go by without acknowledging the death of Ellas McDaniel, better known as Bo Diddley, the subject of an extensive New York Times obituary to which I can at least add an anecdote. I never saw Bo play live, but I did see him in person, coincidentally thanks to my Southern Cone interests. In 1984, after finishing up several weeks of historical research on the Falkland/Malvinas Islands in the Public Records Office at Kew, I flew from London back to Baltimore/Washington International Airport. On board, I noticed a bulky, vaguely familiar black man but never made the connection until, at the luggage carousel in Baltimore, his voice rang out "Anybody see a gui-tar here name of Bo Diddley?" Green: You don't look like no South American to me. Bo: I'm still from South America. In fact, this exchange is not so different from the Argentine gaucho's payada de contrapunto, an improvised singing duel that was usually friendly but could end in a knife fight. According to historian Richard Slatta, many gaucho payadores were Afro-Argentines - a parallelism that makes Bo's lyrical bragadoccio credible. As a rule of thumb, the best time to visit the fauna-rich Patagonian coastline is the austral summer, when penguins, elephant seals, and other beasts that spend the winter at sea come ashore to breed. Winter, though, is when the great right whales arrive to breed and birth at Argentina's Península Valdés, where the season has already begun at the village of Puerto Pirámides, near the city of Puerto Madryn. Some whales stay until December, but the season is strongest from July to October. Chile, though, is bidding to enter the whale-watching sweepstakes in a big way. For a few years now, from December to April in the austral summer, the research biologists who run Punta Arenas-based Whalesound have been taking small groups on a slow boat to Isla Carlos III, in the Strait of Magellan, which has the southern hemisphere's largest humpback feeding grounds. On the island, which lies along a major international shipping channel, there's a sheltered, comfortable camp with sturdy dome tents (essential in this often inclement climate). Whale-watching could be getting even bigger in Chile, though. Last week Chilean President Michelle Bachelet announced that the country's entire 6,000-km coastline will become a whale sanctuary. The next likeliest whale-watching destination will be the southern end of the Isla Grande de Chiloé, where the Gulf of Corcovado - not so far from the volcano-evacuated port of Chaitén - has one of the region's largest blue whale populations.